Walking into Doughboys is like walking into an alternate strange albeit delicious universe. 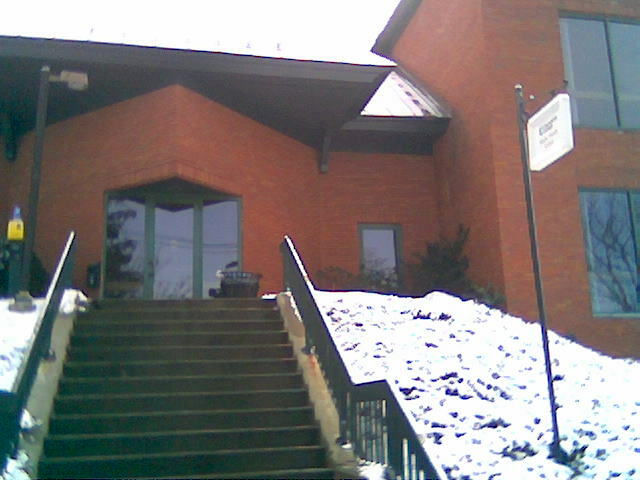 Doughboys is located on the edge of the Old North End (ONE) on Pearl Street in Burlington Vermont. Next door to the restaurant / diner is a bakery where they have doughnuts, I’ll have to review them in the future. The decor looks like it hasn’t been changed since the place opened in 1979, but coinciding with that the prices are extremely reasonable. The service at this family affair is very friendly. I didn’t eat a lot of meatloaf growing up, so this comfort food is still novel to me. I like meatloaf in sandwiches with cheddar, lettuce, fresh tomato on toasted rye, ketchup completes the the sandwich. The meatloaf is griddled, super moist and has great onion flavor from the onions in the loaf. 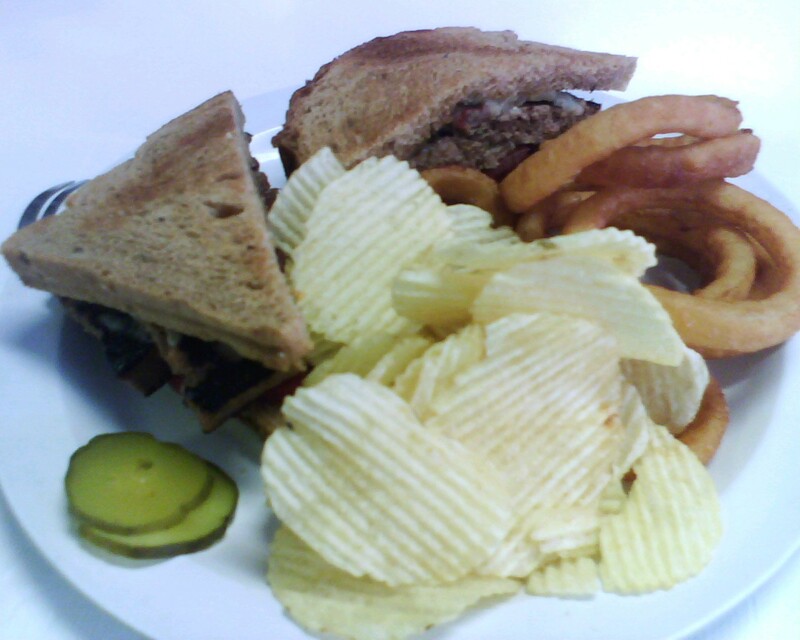 The sandwich comes with chips and pickles slices for an amazing $4.25 (before tax). I think the danger of going to Doughboys is that you feel like you can eat like a monarch and order too much food. The onion rings were OK, kinda bland I’ll probably try the fries next time as I wonder if they’re hand-cut? Admittedly I’m VERY picky about onion rings. In true diner style there was pie available. 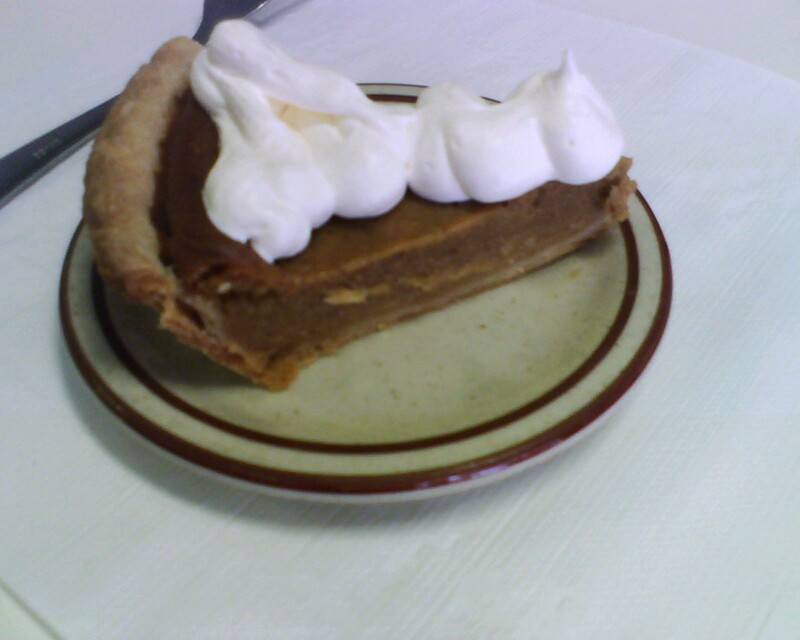 The pumpkin filling had nice subtle spice to it, and the crust was good, however a little low on the flakeyness scale. I enjoyed the REAL whipped cream. I believe the pie was $2.50? 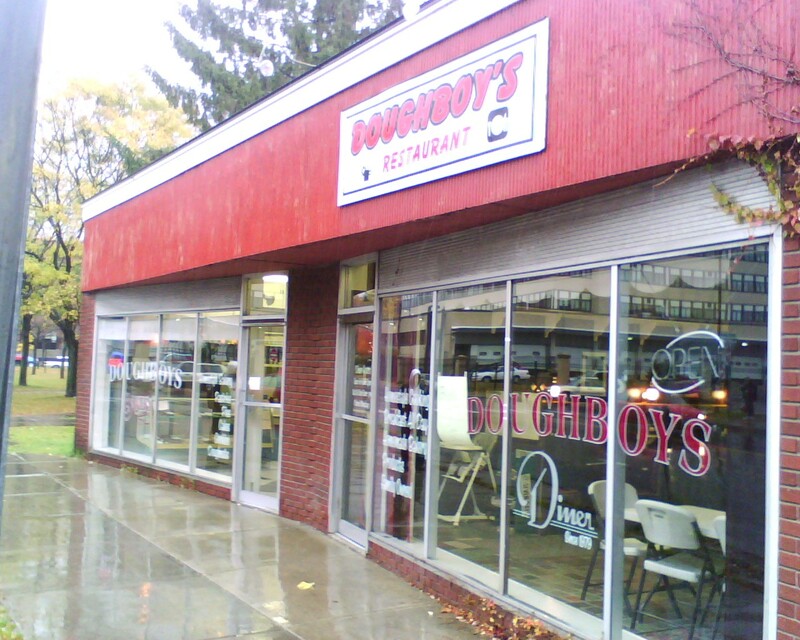 Doughboys is fun to eat at, and the food is inexpensive, I’ll be back. I recommend exploring the Doughboys bakery as I don’t know any other place that makes doughnuts in Burlington (besides the poaching Dunkin Donuts across the street). 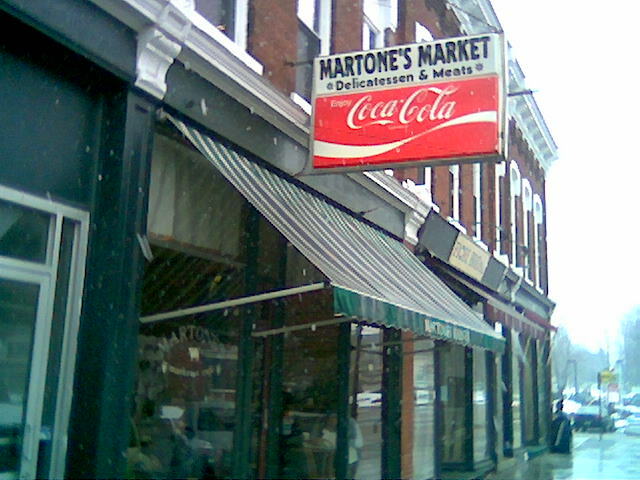 Martone’s is a little deli, “market and cafe” at the 5 corners in Essex Vermont. Besides subs, Martone’s also has a nice selection of steaks; I think I’ll be picking some up once the snow melts to throw on the grill. I like egg salad, something that I don’t bother to make for myself for some reason. 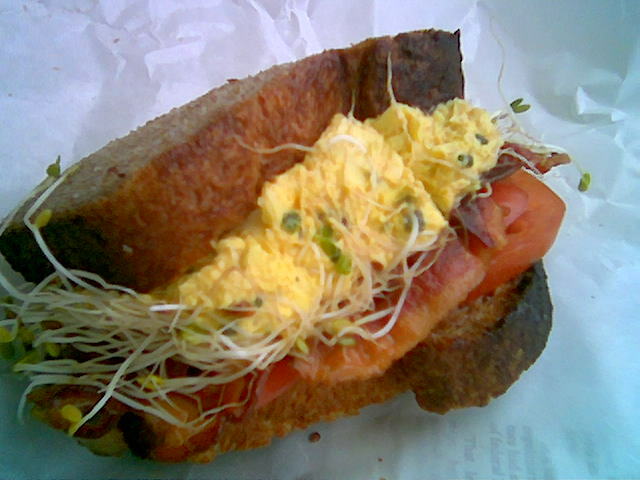 Anyway, someone named “Billy” has similar taste to me, I ordered his namesake sandwich Egg salad and bacon, it kind of like being indecisive if you want breakfast or lunch, so you settle for a sandwich with breakfast elements. The egg salad yummy, green onions, and chunks of egg. The bacon is SO crispy, a nice contrast to the smooth egg salad. 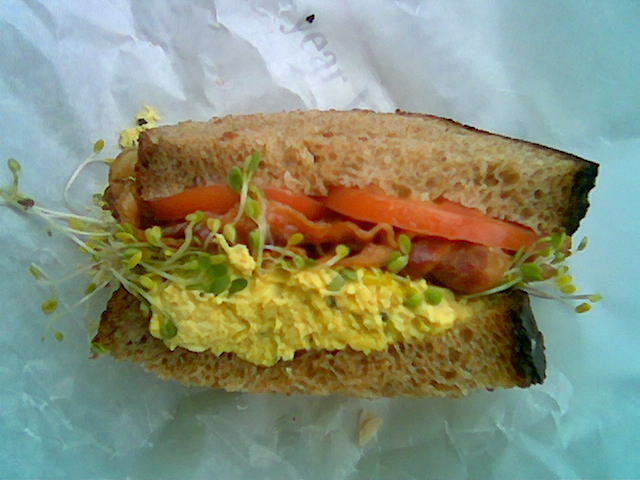 Finally I added sprouts and tomato to the freshly baked wheat bread. The half Billy was $7.25 with tax, I’ll be back to when I need my egg-salad fix. 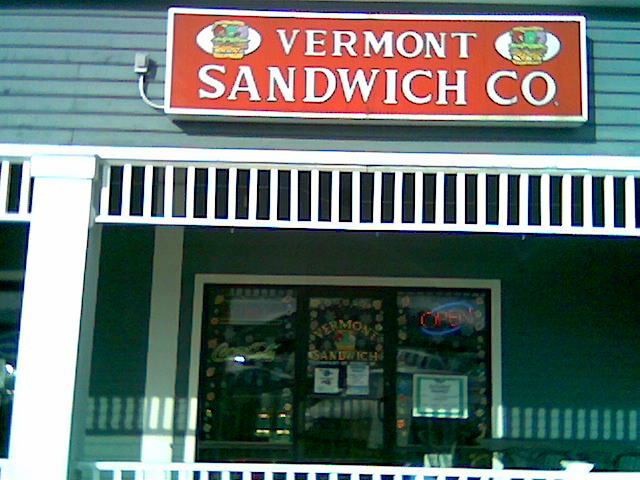 Vermont Sandwich Company is a local (as the name implies) sandwich shop. 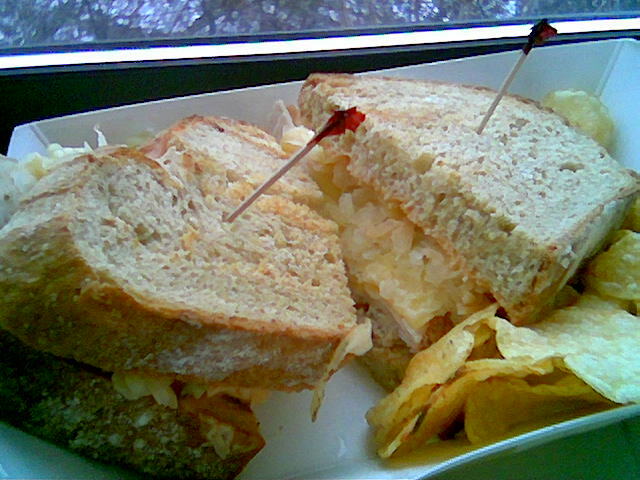 All of their sandwiches have high quality ingredients and breads. I tend to shy away from sandwiches that I can make myself, but there is on in particular at the Vermont Sandwich Company I’m fond of. 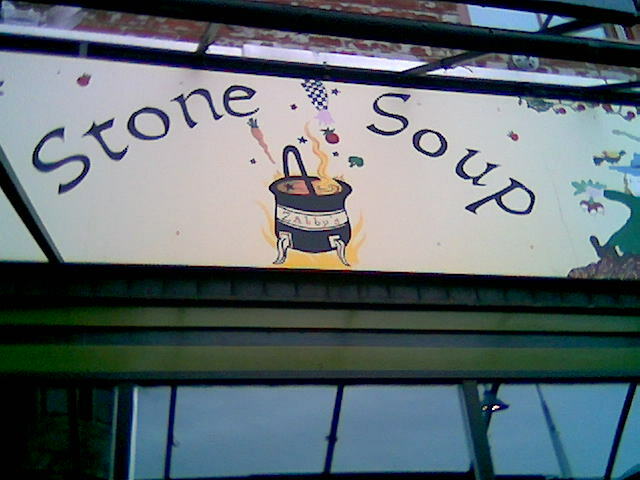 I went to the South Burlington Vermont location on Dorset Street in the Blue Mall (also home to Wings Over Burlington). 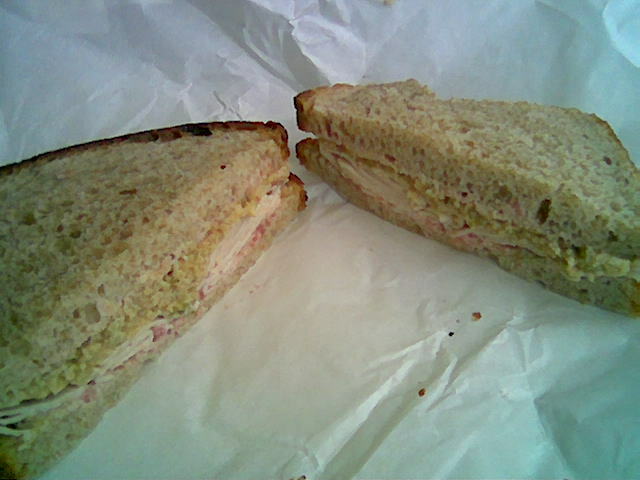 I chose to get my Patriot with wheat bread (comes on white), it is turkey breast, mayo, cranberry sauce, and stuffing. Of course this sandwich reminds me of eating left overs from Thanksgiving Day, which is pretty cool. The combination of flavors is classic, all of the ingredients are good, although I whish there was more cranberry sauce. I also wish the sandwich was a little bigger, so next time I may order mine on a wheat sub roll instead of bread. 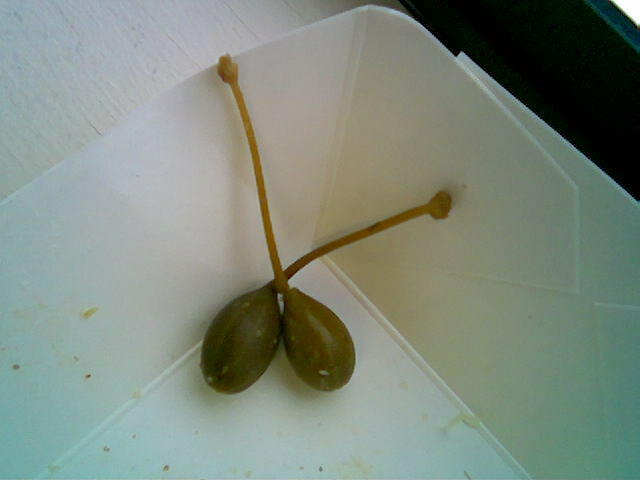 I was on Champlain College‘s beautiful campus today, so I decided to get some lunch there. 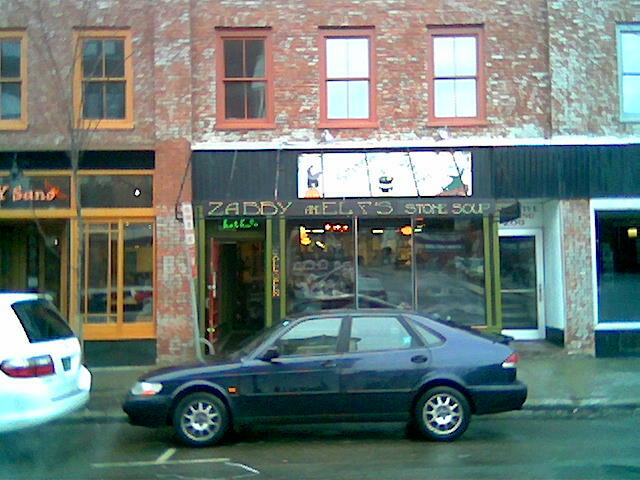 From Maple Street in Burlington Vermont, Jazzman’s Cafe is just through the pictured door. 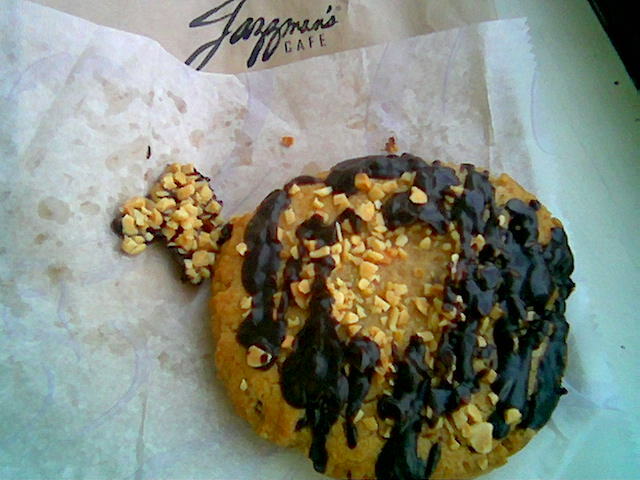 Jazzman’s cafe is actually a chain, and is only one of Champlain’s dining options. Previously in the same location there was a student run cafe, which I actually prefer, but Jazzman’s has surprisingly decent food for a chain. 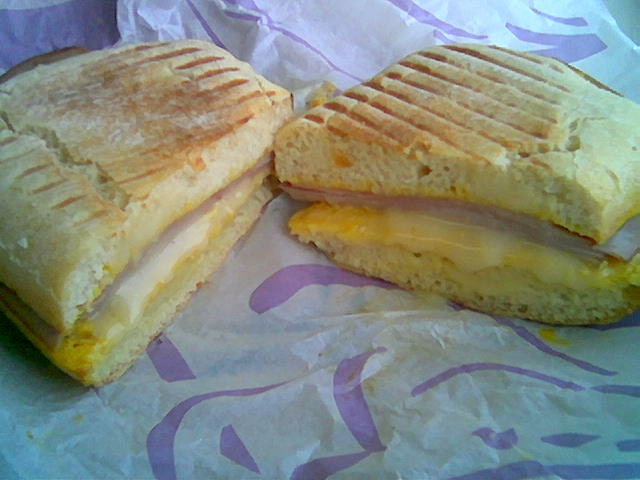 The counter person popped the sandwich in a panini press with good results. The brie was warm and gooey, the ham was good quality, and the Dijon mustard was an excellent choice. This is a ham and cheese with a french accent. I was waffling on getting this soup, as I already had pork in my sandwich, but the cook up-sold me into a cup of this soup. 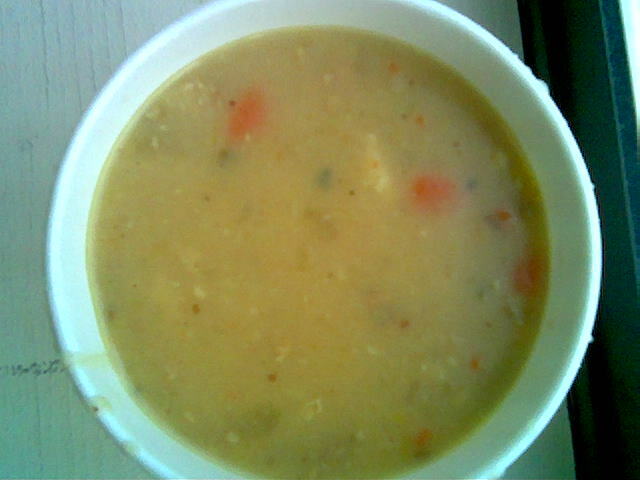 The soup was nice and thick, there were chunks of potatoes, carrots, celery, and small bits of bacon. The soup appropriately hearty on this chilly day, but could have used a little more bacon. Tons of peanut butter flavor – A good peanut butter cookie will likely be crispy on at least the outside. This is probably due to the peanut oil in the peanut butter, this cookie managed to stay soft in the middle. Peanuts!– I actually prefer some chopped peanuts inside the dough, but the result was fine. Dark chocolate in the icing – milk chocolate would have pushed this cookie into the “too sweet” range, just like “peanut butter” cookies, that don’t have enough peanut butter in them. The chocolate chips were also dark, or maybe semi-sweet. I think the soup was $2.50, the cookie $1.50, and the sandwich $5 (everything was under $10 with tax), Jazzman’s Cafe is an inexpensive lunch option.